Sea of Thieves review: is it a master pirate or a landlubber destined for the brig? Whether it’s seeking out fabled treasure in the classic Monkey Island games or scuttling schooners on the open-ocean of Assassin’s Creed IV: Black Flag, there’s nothing quite like hoisting the mainsail and embarking on a pirate odyssey. Add in the whimsical charm that only venerable British studio Rare can provide and a generous helping of online multiplayer and you’ve got one of the year’s most unusual - and most rewarding - virtual voyages. Unlike those other piratical adventures, Sea Of Thieves is something to be experienced with others. Sure, you can opt to set sail on a one-man boat, undertake quests and visit many a mysterious locale all by your lonesome, but you’re getting less than half of the experience. From controlling every aspect of a galleon in tandem with your fellow crew members, to outsmarting other pirates during a midnight ambush, SOT is at its best and fullest when you embrace the co-operative and competitive nature of its online world. It's a title built around the freeform design of that setting, and it's the player-driven stories that unfold within that bring it to life. You begin each and every adventure on the shores of a friendly port, a safe haven of sorts where you can undertake quests (known as ‘voyages’ in SOT perlance), use gold to buy new weapons and clothing and acquire extra items to help out with the journey to come. You can then head out and sail to any island you wish, but these missions - distributed by three very different factions, each with their own rewards and benefits - help funnel you in the right direction. Smaller ships require fewer crew members, but they’re easier to sink than big galleons. Larger ships, on the other hand, require more co-operation between each player. One will take the wheel and steer, while another waits on deck and adjusts the mainsail to catch the wind. Another will man the cannons, while a fourth uses their spyglass to spot distant dangers. That, or you'll all spend most of your time dancing around the deck, playing the accordion and drinking so much grog you vomit over the side in spectacular fashion. It’s this inherent childlike silliness that stops SOT from taking itself too seriously. Sure, there are skeletons to fight and curses to unleash across its open-world, but why get so serious when you can also fire your friends out of cannons before you get there? That cute exterior shouldn’t fool you either. There’s an empowering sense of depth to the mechanics Rare has weaved together for its first proper game in years, and it’s these little secrets that transform how you play. Like when you discover that you can drop anchor at a certain speed and pull off a maritime handbrake turn (perfect for getting the drop on a crew attempting to steal your booty), or how being sick inside a bucket can be used as a weapon. How there are chests full of booty that will make you blind drunk every time you pick them or up, or curse you up to the nines if you dare touch them. There’s even a kraken out there, should you be bold/unlucky enough to run into it. Voyages form the core loop of SOT, and its three main companies - the Gold Hoarders, the Order of Souls and the Merchant Alliance - each offer a different type of quest to undertake. Gold Hoarders provide maps for you to hunt and retrieve treasure; the Merchant Alliance tasks you with delivering cargo and the Order of Souls pays gold in exchange for glowing skulls (which you’ll need to remove from the necks of their skeletal owners, naturally). These quests are different enough from one another, and provide the impetus to set sail, but they do become repetitive after a while since the template very rarely changes. The lack of any real progression system does make your progress, bar the customisation of your pirate and your ship, difficult to quantify at times. Completing voyages for a given company improves your ranking with each one, but there’s very little to do enhance your own avatar bar their aesthetic or the flashy flintlock pistol they’re carrying. It’s clearly a conscious decision - Rare wants you to focus on the rewards of working with your crew, and the player stories that develop therein, rather than on the progress of your own character - but it can make pushing further into its piratical setting less appealing unless you’ve got a crew of mates to do it with. We also experienced our fair share of technical difficulties while playing. While mechanically the game runs with nary a hint of slowdown - and you really will catch your breath when you see the beauty of SOT’s dynamic waves and the warm glow of its sunsets - but consistent server issues lock us out of the game for hours at a time. 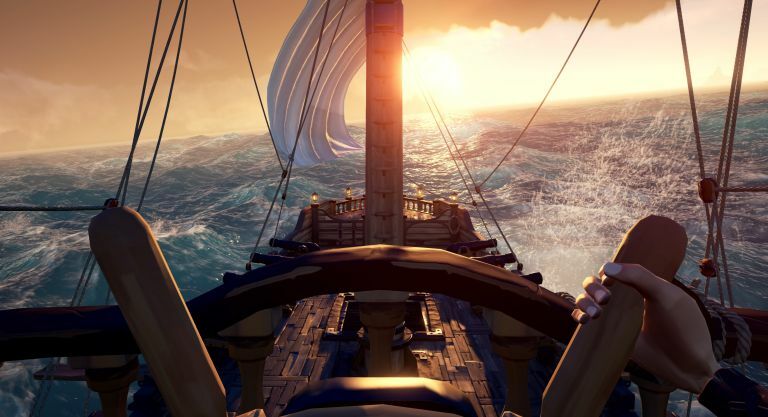 Rare is currently working to iron out the kinks, and every online-centric title experiences such launch difficulties, but it made attempting to even log in a needlessly difficult experience from day one. We also encountered issues with voyages not producing gold, even when completed and handed in. Again, Rare says it's working on a fix, but it can be a kick in the teeth when you've worked so hard to finish your quest. Despite these server issues, and a lack of tangible progress tracking, there really is nothing out there quite like Sea Of Thieves. It’s mixture of co-operative plundering and competitive raiding is ripe for some amazing online experiences, but they’re also susceptible to some pretty heavy griefing and trolling. However, bag yourself a decent, like-minded crew and the freefrom design of its open oceans is a wonder to behold. There are so many secrets to uncover, and so much of that quintessential Rare magic to find, its a game worth overcoming every hiccup to experience it in all its maritime glory. The next Xbox is already looking like it is going to be a very special system. But will it beat the PS5? Is this the next mini console to start selling out soon?